After taking part in the celebration of the record-breaking Berlin Marathon, where she was part of the commentator team for ARD Television, Uta will run the annual “Strausseelauf” event. This will be Uta’s ninth time joining the race. The event is a local tradition dating back to 1924, and was part of Uta’s childhood memories and younger running years. The race is the last part of a three event series. These include swim and bike races that began in July. Participants include athletes and recreational runners from all over Germany, and also children and students. Uta will run the 9.2K course with the adults and older youths of which she still holds the course record. There is also a shorter 4.1K course. Afterwards, Uta will help with the awards ceremony and the presentation of the storied cup of Mayor. 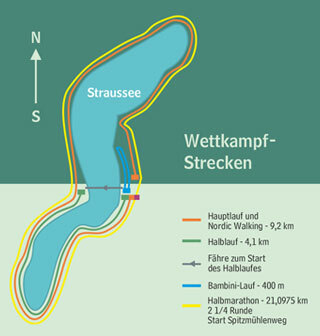 The main 9.2K run, as well as the Nordic walking and kids’ events, start near the Straussee lake — Fichteplatz/August-Bebel-Straße, 15344 Strausberg. The starting line of the 4.1K race and the half marathon is located on the other side of the lake. Transportation to this point will be provided by a ferry.